The online version of this article ( https://doi.org/10.1186/s12864-019-5661-x) contains supplementary material, which is available to authorized users. Despite the awareness of the importance of reference genes, most previous studies directly applied commonly used reference genes for gene expression quantification without validation or conducted reference gene selection from a few traditionally used reference genes [3, 4, 5, 6]. However, an increasing number of recent studies have shown that the frequently used reference genes are not always stable under different conditions [7, 8]. Housekeeping genes, which maintain constant expression levels in all cells and under all conditions, are an ideal source for reference gene selection. In mammals, housekeeping genes have been detected using various large-scale gene expression profiling methods, such as expressed sequence tags (ESTs), serial analysis of gene expression (SAGE) and microarray analysis [9, 10, 11]. The advent of RNA-Seq enables the identification of housekeeping genes in well-studied model organisms and less-studied nonmodel organisms. To date, housekeeping or reference genes have been successfully identified from transcriptome data in various organisms, such as humans , mice , zebrafish , tomato , seaweed  and kiwi . Bivalve mollusks comprise approximately 14,000 existing species that are widely distributed worldwide. Many of these species are economically important aquaculture shellfish; therefore, extensive studies on the genes related to immunity [18, 19, 20], growth [21, 22, 23] and reproduction [24, 25] have been conducted in this group of animals. Gene expression quantification via RT-qPCR has been extensively conducted, but mostly using a single reference gene, such as ACT and CYTC [26, 27, 28]. 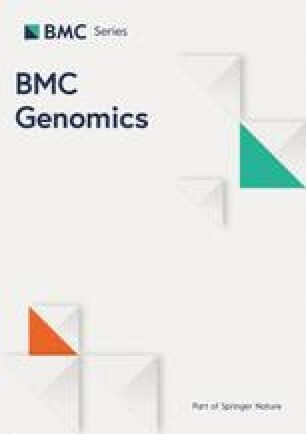 To eliminate misleading effects due to the use of inappropriate reference genes, reference genes have been selected but generally focused on some traditionally used genes [29, 30, 31]. To our knowledge, the transcriptome-wide identification of reference genes has only been conducted in the Pacific oyster [32, 33], despite the availability of extensive transcriptome data in various organisms [34, 35, 36, 37, 38]. The reference genes were detected using the method provided by Eisenberg and Levanon , with minor modifications. Briefly, considering that RPKM is not appropriate for comparisons between samples [44, 45, 46], we used TPM values to measure gene expression levels. 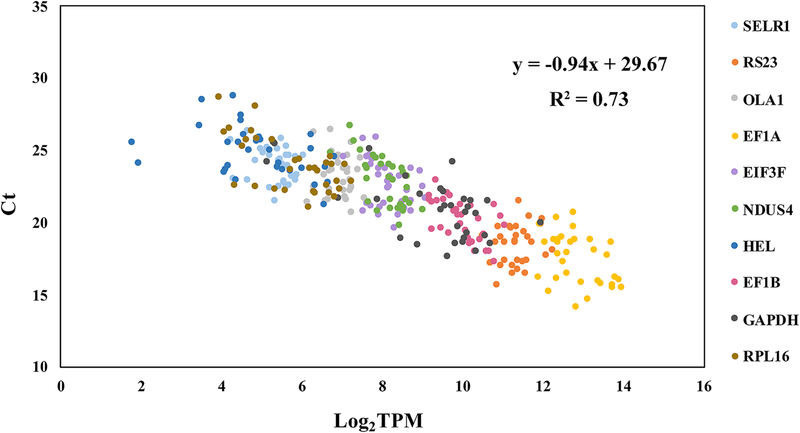 After calculating the TPM values for each gene in all samples, TPMs from biological replicates were averaged for subsequent analysis. Finally, four criteria were adopted for the detection of reference genes: (I) expression observed in all tissue types or developmental stages; (II) low variance over tissues or developmental stages by requiring standard-deviation [log2(TPM)] < 1; (III) no exceptional expression in any single tissue or developmental stage by requiring no log2(TPM) differed from the mean log2(TPM) by two or more; and (IV) medium to high expression level by requiring mean [log2(TPM)] > 5. The stability of the candidate reference genes was further evaluated according to the coefficient of variation (CV = stdev/mean). Here, all candidate reference genes have a mean [log2(TPM)] > 5 and a standard-deviation [log2(TPM)] < 1, so their CV values are always less than 0.2. For bivalves of economic importance, some research has been conducted on genes related to reproduction [58, 59, 60]. 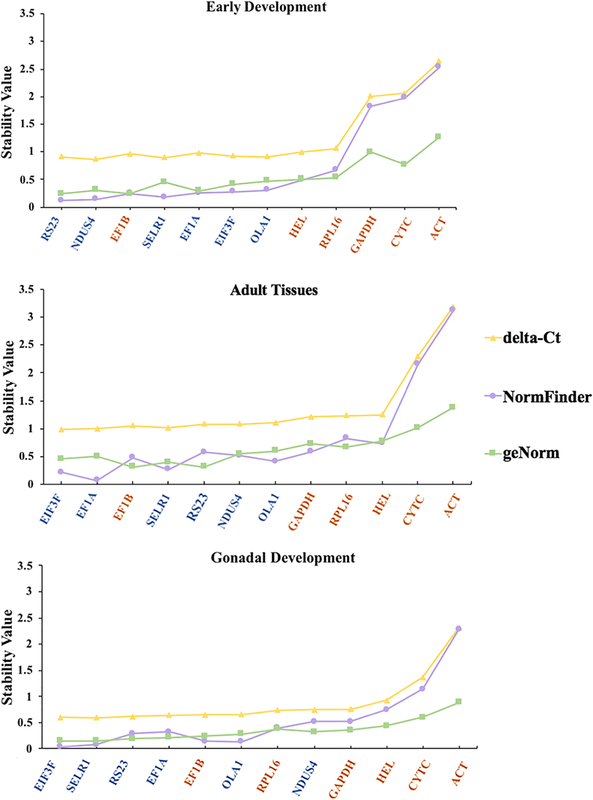 Examining their expression dynamics during gonadal development is an important task in these studies. However, several traditionally used reference genes, such as EF1A [36, 40, 61], ACT  and GAPDH  have been applied, and until now, no study on the transcriptome-wide identification of reference genes in bivalves has been reported. According to our results from RNA-Seq analysis and RT-qPCR validation, ACT is not an appropriate reference gene and may result in misleading conclusions. Based on RT-qPCR analysis, EF1A ranks fourth after EIF3F, SELR1 and RS23, indicating that these genes are all suitable reference genes. The four genes exhibit different expression levels, with EF1A being most abundant, followed by RS23, EIF3F and SELR1; thus, researchers can select a reference gene according to the expression level of the genes of interest.